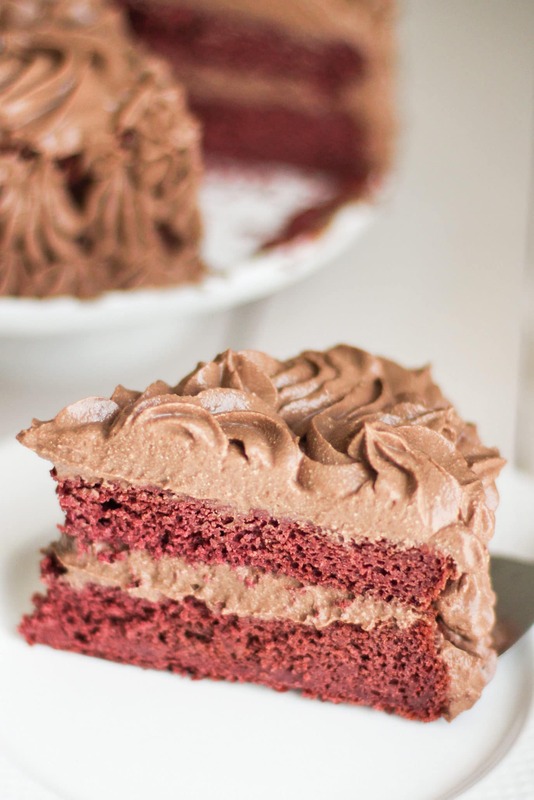 Healthy Vegan Red Velvet Cake with Chocolate Mousse Frosting! Have you ever heard such glorious words come out of my mouth?? This cake recipe is naturally red, low sugar, high protein, high fiber, whole grain, gluten free, and dairy free! And it still tastes good. No, it doesn’t taste good, it tastes great. It tastes BOMB. It tastes like magic. One bite and you’ll be like FTW. Perfect thing to celebrate my 24th birthday? I think YES. It hit me a couple weeks ago that my bday was coming up. I was totally shocked and kind of appalled that I didn’t plan ahead and make a super special recipe to post on this day. Since I recently made a batch of Homemade Rainbow Confetti, I was thinking something Funfetti, but the recipe I tried out flopped. I was out of eggs, but wanted cake. And that’s when Red Velvet Cake popped into my head. I said, “No, I can’t do that, that still has eggs in it!” BUT THEN. I REMEMBERED. I posted a Vegan Red Velvet Cake recipe a few years ago. I have been meaning to revamp the recipe because I felt like the flavor and texture could be improved. I made some recipe edits (trials are explained below) and got started. What came out of the oven? A SUCCESSFUL CAKE! It’s got a secret ingredient, too. Can you guess what it is? Actually, there are TWO secret ingredients. If you can guess them both, you are a genius, and as a prize you deserve a slice of this cake. Make that two slices, because it’s so damn good and addictive, you’ll want an extra piece. Join my “‘I’ll have two slices, please’ Cake-Eating Club!” It’s super top secret, and I’m only givin’ out this offer ONCE. Come to the dark side, we’ve got cake. In my first two trials (read: totally failed recipes), I used an egg replacer powder to substitute the egg whites from the original recipe. Toootally didn’t work. The “cake” was a dense and chewy reddish brick. The only way I could salvage the flop (throwing food away = throwing money away) was by blending it into Vanilla Bean Frappuccinos over the course of a few days. If you haven’t tried tossing a slice of cake into a milkshake, I feel sorry for you. You’re missing out. In my third trial, I tried using blended tofu to replace the egg whites. This helped add bulk to the cake so it didn’t collapse and condense when I brought it out of the oven. However, the “cake” was still heavy and pretty dense. In my fourth trial, I pressed on with the tofu puree, decreased the amount of almond milk, and doubled the baking powder. This helped tremendously! While the cake was still pretty dense, it was a good kind of dense. Sort of like a decadent muffin rather than a cake. The cake itself was alright. While I wouldn’t call it “bad,” it certainly wasn’t as good as the next trial. And finally, we have our fifth (and final) trial: this lovely and light, moist and fluffy, can’t-get-enough-of-this-stuff Healthy Vegan Red Velvet Cake with Chocolate Mousse Frosting. I realized in the end that this cake never really needed an egg replacer. It just needed a bit more starch, baking powder, and milk. You would never ever ever ever ever EVER guess that this is vegan. I am so happy with the results of this fifth trial. The contrast between the light and fluffy cake and decadently rich frosting is divine. I always wished red velvet cakes had more chocolate flavor in them, so my prayers were answered with this oh-so-delicious frosting. 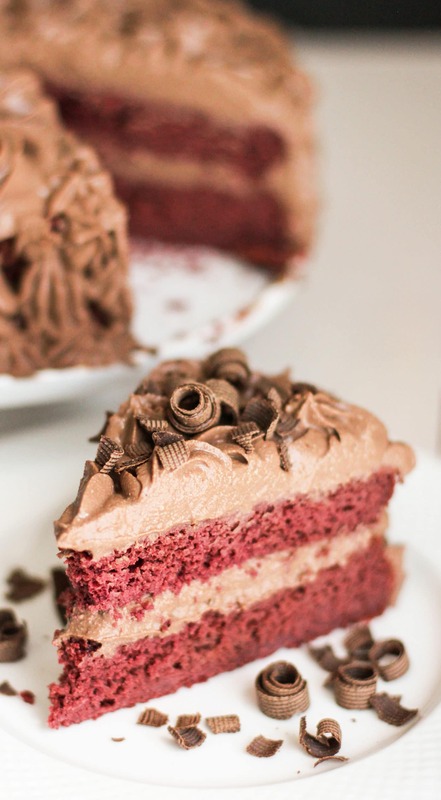 Healthy Vegan Red Velvet Cake with Chocolate Mousse Frosting! Have you ever heard such glorious words?? This cake recipe is naturally red, low sugar, high protein, high fiber, whole grain, gluten free, and dairy free! And it still tastes good. No, it tastes great. It tastes like magic. Rinse and gently scrub 4 medium beets, then individually wrap them in foil. Place the beets on a jelly roll pan and bake for 1 hour, or until a fork pierces through the center of the beets with ease. Carefully unwrap the beets and let cool for 30 minutes. Scrape off the beet skins (they should peel off easily) and chop into chunks. Add the beet chunks to a food processor and purée until completely smooth. Preheat the oven to 350 degrees Fahrenheit and spray two 8" cake pans with cooking spray. In a stand mixer bowl with whisk attachment, add the beet puree, almond milk, melted coconut oil, vanilla, butter flavor, and stevia extract. Mix on low speed. In a medium-sized bowl, whisk together the oat flour, sorghum flour, erythritol, starch, cocoa powder, baking powder, and salt. 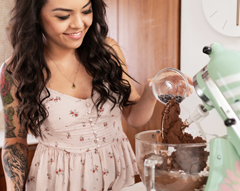 Dump the dry ingredients into the stand mixer and mix on medium speed until fully incorporated. Scrape down the sides of the bowl, then return to medium speed. Add the vinegar in LAST. Moving quickly now, pour the batter into the prepared pans and place them in the oven. Bake for 27-31 minutes, or until the surface of the cakes spring back when tapped. Let the cakes cool in the pan. Drain the package of tofu and place the tofu block on paper towels. Press as much liquid out of the tofu as possible. Place the tofu, coconut milk, vanilla, powdered erythritol, and salt in a food processor or high-speed blender. Puree until completely smooth. Scrape down the sides of the processor or blender. While blending, pour in the melted chocolate. Blend until fully incorporated. Pour the mixture into a large bowl. Cover with plastic wrap and refrigerate for 4+ hours or overnight. Frost the cake, then refrigerate for 30 minutes to an hour to set up. Slice and serve! If you want this recipe to be entirely sugar-free, use No Sugar Added Chocolate in place of the Dark Chocolate! As a comparison, here is the nutrition label for Food Network’s Red Velvet Cake. I am utterly horrified right now. For the SAME sized slice of cake, one slice has 680 calories while the other has 320. One slice has 41g fat while the other has 16.5g. One slice has 43g sugar (nearly ¼ cup!) while the other has just 6g. Um, I think I’ll choose my cake. Not only because you can easily have two slices guilt-free (and 2 slices will still have less calories than 1 slice of the unhealthy version), but because it’s made with quality ingredients. I don’t use the refined cake flour, the processed-to-the-bone white sugar, or hydrogenated shortening. None of that crap. Who needs dangerous trans fats in cake?? This Vegan Red Velvet Cake is high in fiber, protein, and complex carbs, so it will keep you fuller for longer. You won’t get a sugar-rush and sugar-crash like you would if you were to eat the unhealthy version! Okay, rant over. Gonna go settle my nerves right now with a slice of this hella goodness. I could eat this (new and improved) cake all day long. And I could MOST DEF eat the frosting STRAIGHT. UP. Whether you’re allergic to eggs or dairy or you’re vegan, you still need cake in your life. You still need Red Velvet Cake in yo life! Enjoy. Now that I’m officially 24 years of age, it’s starting to sink in that I started this blog nearly 5½ years ago. Back when I was a freshman in college, as a way to procrastinate studying for finals, I was seriously struggling — struggling to figure out my place in life, struggling to find motivation (from studying to living life at all). Those were the roughest and toughest years of my life, it’s even hard to think back to it right now. The immense pressure and stress from school, the nonstop studying of math and Chemistry (which I despise and am terrible at), and I was alone on the opposite side of the country from my family. This blog, the online community, YOU… those are the reasons why I kept going, why I kept blogging, why I stayed in school, why I decided to get better. While I am still trying to find my place in life (still have ZERO clue what I want to do — is it a bakery, is it selling a healthy food product, what is it, what is it, WHAT THE HELL IS IT, TELL ME! ), I am happy where I am at this point in time. Even though I’m working two full-time jobs and am having a hard time managing my work-/personal-/dog-/family-life, this is part of growing up and I’m happy where I am. Life isn’t easy, it can’t be easy, but it does get better. It gets awesome. Life is awesome right now. I can’t wait to see what’s in store for me as a 24-year-old, and I hope you stay tuned to see it through too. Wow, that looks delicious! 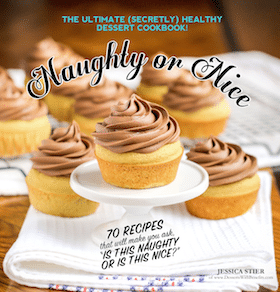 I love the look of that frosting; I’ll have to try that on some dark chocolate cupcakes… I’m too big of a chocoholic! I’ve actually never had issues replacing eggs with Ener-G before! Did you mix it with warm water before adding it to the batter? That always seems to work for me… But you also called for flours that I haven’t used it with before, so maybe I shouldn’t speak so quickly! Mmm, this frosting would be delicious on cupcakes! That looks fantastic. I’ve used a ground flax seed and water mixture to substitute eggs in my baked goods before, but it doesn’t work very well when trying to substitute for more than two eggs (in my experiments). Since I’m trying to cut back on my soy consumption, what do you think of potentially using mashed banana(s) for egg substitution? I read about it on the Kitchn yesterday, but might be a little concerned about infusing banana flavor into the epic chocolatyness of this cake. 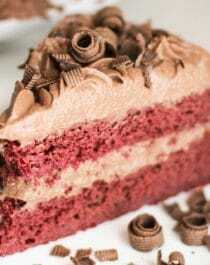 (not that banana and chocolate is a bad pairing, but it’s red velevet cake!) What do you and your readers think? As for the tofu replacement, I am hesitant to give any replacements because it took so many trials to perfect this cake. Mashed banana will add a banana-y flavor and make the cake a little too dense/moist. Aaaah this looks BLISSFUL! I’d love to try this, but maybe in smaller portions. Do you think I could try making it as mini-cakes, or cupcakes? I have a few beets to use up, so I’d love to make this recipe this weekend. Mmmm red velvet cupcakes! That sounds delicious, I’m sure this recipe will work as cupcakes… I need to try that ASAP 🙂 How did I not think of that?? Thank you this looks awesome! Do you think I could successfully replace the sourghum and rice flours with coconut flour? 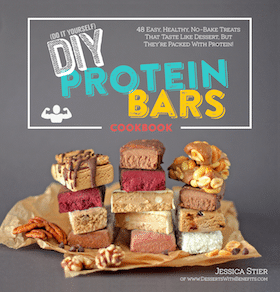 I was so excited to find this recipe – it handles all my dietary concerns beautifully. I was disappointed to find that the first overwhelming taste when I bit into my first slice was the beets. They over-power the gooey goodness that is the cake itself and the mousse does little to cut the flavor. I had a few others try it, and they felt similarly. Any suggestions on how to improve this issue? Yay I’m so glad you’re gonna try the recipe! Just make sure to reduce the baking time slightly, they should be done when the tops of the cupcakes spring back when tapped. Hope you like the cupcakes!! Hey can I substitute the above mentioned flours with all purpose flour. I’ve never used all purpose flour so I can’t say :/ sorry! HAPPY 24TH BIRTHDAY JESSICA!!! <3 I am so excited to see where your life takes you, and pleaseeee open a bakery, but here on the East Coast so I can be your first employee. 😉 Cheers to this cake and to you dear! Any possible substitutes for cocoa powder? I’m allergic to cocoa. Would more sorghum or oat flour work? How sweet is the cake? Your recipes are absolutely fantastic! though it is quite heartbreaking I can’t try them as is, I live in Pakistan where you can’t source things like sweet white sorghum flour, even coconut flour is hard to come by and often costs an arm and a leg as these things are imported and very limited in stick. I’m looking into making my own coconut flour. In the mean while is there any replacement I can use for the sorghum flour? I am a type 1 diabetic who moved from Australia to Pakistan, I have a HUGE sweet tooth and am constantly on the look out for healthy and nutritious desserts to serve myself and my sweet tooth family. Thank you. Wow, Australia to Pakistan! What a move! I hope you like it there, though, despite not being able to bake some stuff. I’m sorry some of these ingredients aren’t easy for you to get. While I haven’t tried subbing the sorghum flour here, I think you might be able to use brown rice flour or a mix of oat flour + starch (I’d say in total, try 165g or 1 cup + 6 tbs of oat flour and 100g or 1/2 cup + 2 tbs of arrowroot starch). Pingback: Gluten-Free Red White and Blue Velvet Cupcakes to Celebrate July 4th!